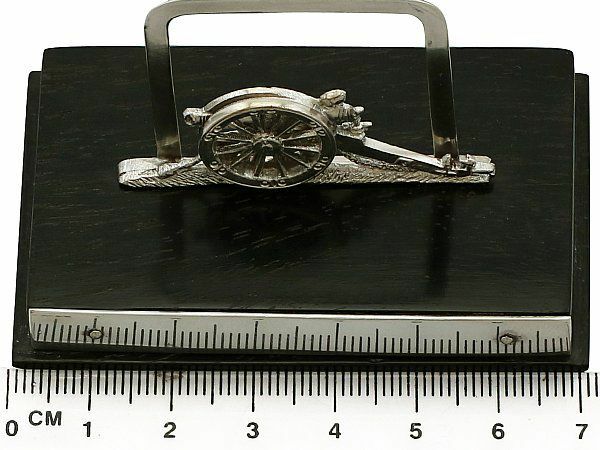 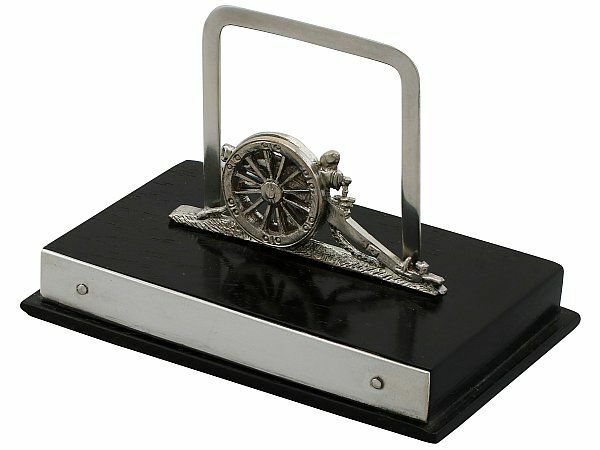 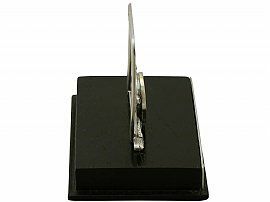 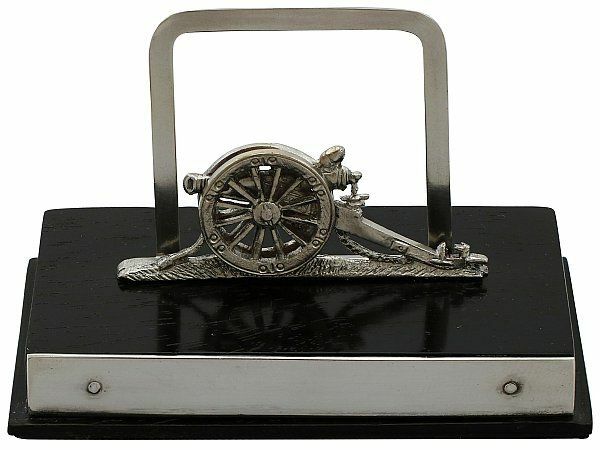 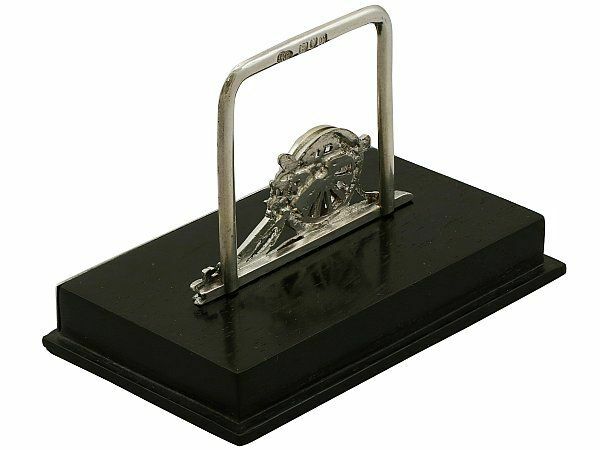 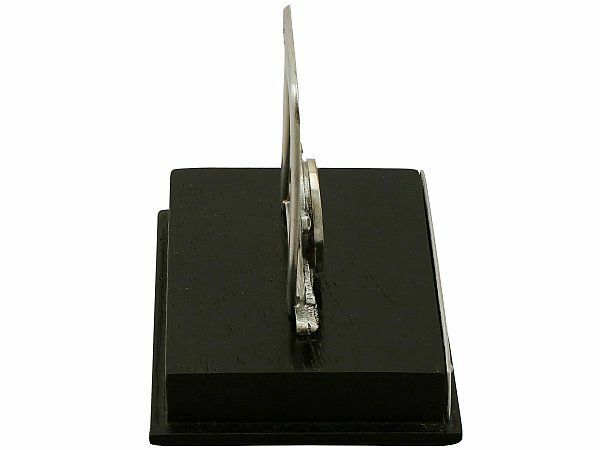 These fine George V sterling silver menu holders have a rounded rectangular frame onto a plain rectangular base. 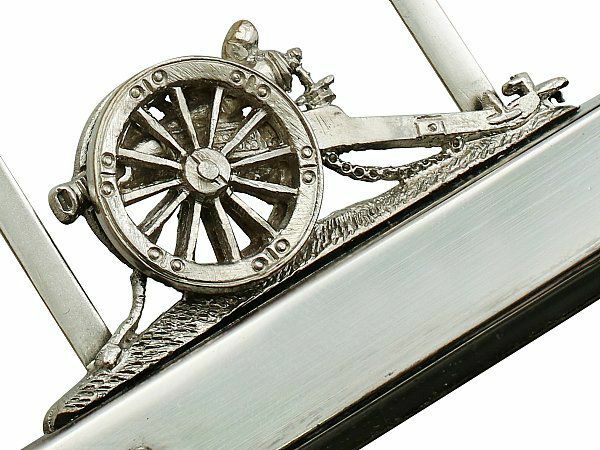 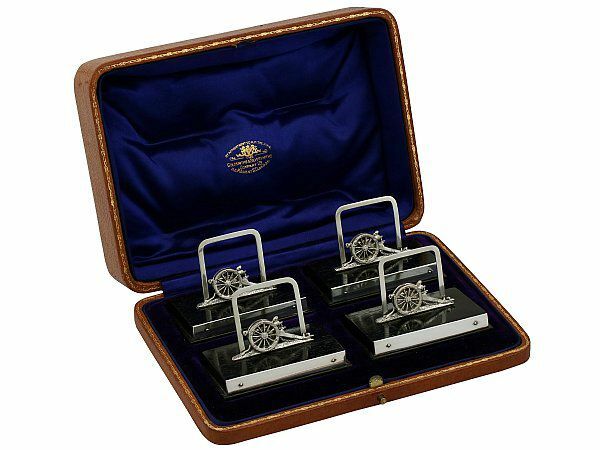 The holders are individually embellished with sterling silver single barrel cannon on a mound ornaments to the centre of the plain frames. 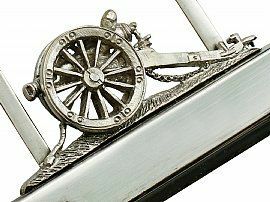 The cannon designs are ornamented with chased decoration to reproduce the details of the cannon's chains, rivets in the wheel and terrain texture to the mound. 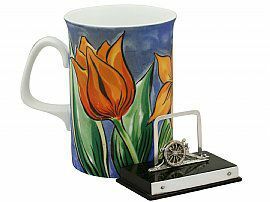 Each holder is fitted to the original and impressive painted wood base, securing to the underside with two hallmarked wing nuts. 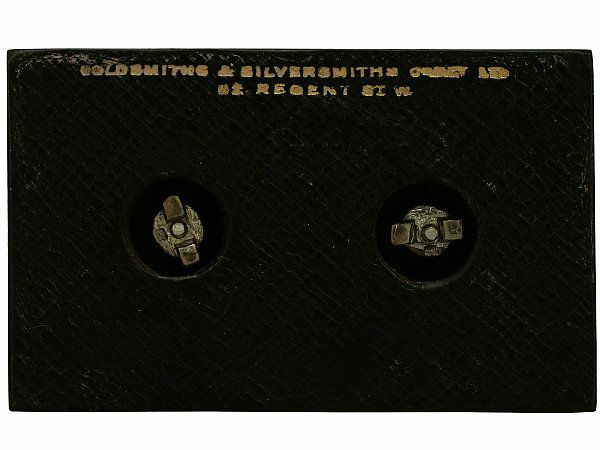 The underside of each base is fitted with the original leatherette covering and bears the retailer's mark 'Goldsmiths & Silversmiths Company Ltd, 112 Regent St, W'; these features are a sign of quality. This impressive set of antique menu holders in sterling silver are fitted to the original hinged leatherette box with satin and velvet lined interior, securing with a push fit catch. 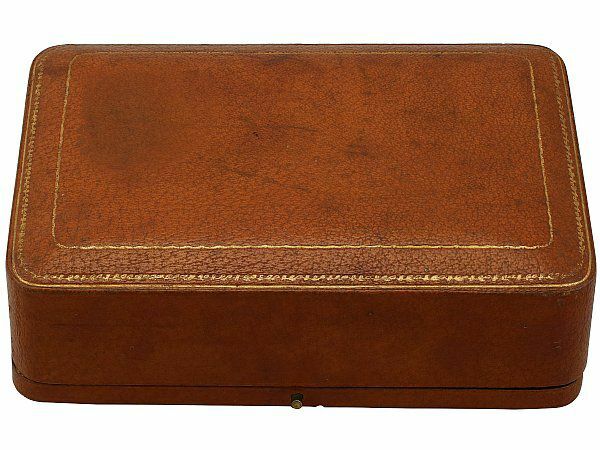 The interior of the box bears the retailer's mark 'By appointment to H.M. the King, The Goldsmiths & Silversmiths Company Ltd, 112 Regency St London'. 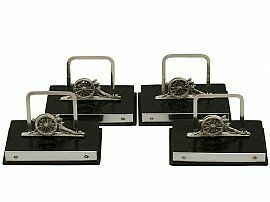 These antique menu holders in sterling silver are a very good gauge of silver, fine quality and in excellent presentation condition. The box is also in excellent presentation condition, in keeping with age. Full hallmarks struck to the reverse of each support are all very clear. 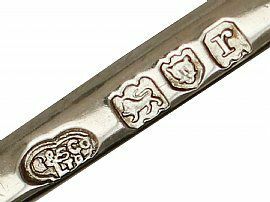 An accurate weight of silver cannot be provided as each piece is mounted on a wooden base.